SQL Reporting Services 2008 from ASPHostPortal. We can install and/or migrate all your reports in a timely. We offer SQL SSRS 2008 based hosting plan from just $5/month. ASPHostPortal.com offers SQL 2008 Reporting Services as an optional addon. SQL 2008 Reporting Services can connect with both SQL 2008 databases and SQL 2005 databases. SQL Server 2008 Reporting Services (RS) is a powerful solution that enables the authoring, management, and delivery of both paper-oriented reports and interactive Web-based reports. Included with SQL Server 2008 is a group of interrelated applications, collectively known as SQL Server Reporting Service (SSRS). SSRS includes all the development and management pieces necessary to publish end user reports in HTML, PDF, Excel, and CSV formats. Originally released as a SQL 2000 separate add on that could be downloaded from the web, all the Reporting Server pieces are now bundled in SQL 2008. Report developers can create reports to be published using use Report Definition Language (RDL), an XML-based industry standard used to define reports. Report definitions, folders, and resources are published and managed as a Web service. New in SQL Server 2008 Reporting Services, administrators can use the Management Studio to organize reports and data sources, schedule report execution and delivery, and track reporting history. This allows for easy customization of a site's look-and-feel. You can define style information in a common location called a "theme" and apply that style information globally to pages or controls in a site. SQL Server Reporting Services supports both on-demand (pull) and event-based (push) delivery of reports. SQL Server Reporting Services can be used to create end user reports in several different formats including HTML, PDF, and Excel. SQL Server Reporting Services implements a flexible, role-based security model to protect reports and reporting resources. 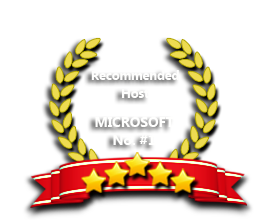 Our Windows Cloud Hosting fully supports SQL Server 2008 Reporting Services hosting. You are more than welcome to try our Free Windows Cloud Hosting before you decide to buy. You can get your Free Cloud Windows hosting account up and running within the next few minutes.